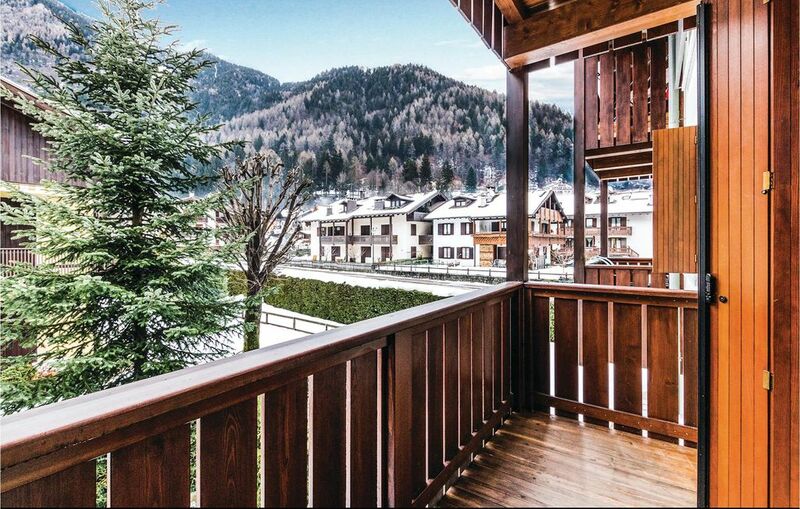 Holiday apartment in a residence located outside the characteristic village of Carisolo, in the Adamello Brenta Natural Park and only 15 km from Madonna di Campiglio, the pearl of the Dolomites. The accommodations can be on the first or second floor of the residence, which is equipped with a lift. In the communal areas are available a dining area and TV, a wellness area with Turkish bath and relaxation area (upon payment, agreements to be taken on the spot), heated storage room for skis and boots. If you love trekking and cycling, a scenic cycle path of approx. 25 km starts from Carisolo. For those who love cross-country skiing at 450 m there is a track that connects Carisolo, Pinzolo, Giustino and Caderzone, there is also a 2 km illuminated ring for skiing even at night. For downhill skiing, at 5 minutes by car, but also reachable by bus, there are the Pinzolo ski lifts of the Campiglio Dolomiti ski area which includes 150 km of slopes of different difficulty and connects Carisolo to Madonna di Campiglio, Folgarida and Marillevae. Available are also 4 snow parks. Other winter sports that you can practice are excursions with dog sleds, snowshoes, ice skating. The area is also ideal for summer sports such as rock climbing, paragliding, trekking and golf. Art lovers can visit the church of Carisolo dedicated to S. Nicola and that of S. Stefano on the cliff overlooking the Sarca river. At 52 km Riva del Garda with the possibility of windsurfing. In the same residence are the apartments IDD216 - IDD224 and IDD312 - IDD314. The pictures are just examples.